This study extends current research on the relation- ship of parenting processes to adolescent sexual behavior by asking what parenting behaviors are related to sexual risk taking among sexually active adolescent males and females. Parenting behaviors considered were communication about sexual is- sues, support, and psychological and behavioral controls. Sexual risk taking was assessed by using a composite measure of the number of sexual partners, the consistency of contraceptive use, and the effectiveness of contraceptive method. The sample of 350 primarily White ninth- to 12th-grade stu- dents was drawn from a population of 2,257 junior and high school students who were surveyed as part of a larger study. Logistic regression analysis revealed gender differences in the effect of parents' behaviors on the sexual risk taking of their sons and daughters. An interaction effect was observed between parental communication about sexual is- sues and perceived parental support for males only. For females, parental psychological control increased the odds that a sexually active daughter would take more sexual risks. In addition, parental monitoring significantly decreased the odds that sexually active male and female adolescents would be high risk takers. Rodgers, K. B. (1999). Parenting processes related to sexual risk-taking behaviors of adolescent males and females. 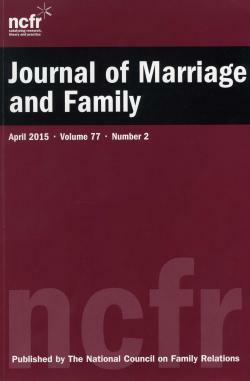 Journal of Marriage and the Family, 99-109. Using a resiliency framework, we examined familial and extrafamilial factors associated with adolescent well-being in intact, blended, and divorced single-parent families. Hierarchical regression analyses were conducted using a large sample of 7th-, 9th-, and 11th-grade adolescents (N= 2,011) to test the moderating effect of peer support, school attachment, and neighbor support when parental support and monitoring were low. Significant two- and three-way interactions were probed. Findings indicate that divorced and blended families have some of the same forms of resiliency as intact families. For adolescents in a divorced single-parent family, peer support moderated the effect of low parental support on internalizing symptoms. We discuss the merits of examining divorce from a resiliency perspective. Rodgers, K. B., & Rose, H. A. (2002). Risk and resiliency factors among adolescents who experience marital transitions. Journal of Marriage and Family, 64(4), 1024-1037. Compared to peers in intact families, adolescents in divorced families do not perform as well academically. Using an ecological framework, we ran hierarchical regressions to examine the effect of parental support and monitoring and school attachment on grade point average (GPA) in teens in intact (60%), single-divorced (20%), and blended (20%) families. In this study, 1925 students in grades 7 (45%), 9 (31%), and 11 (24%), with a mean age of 15 years completed a survey. The sample was mostly White (88%), with 11% African-American; 53% were female. We hypothesized that adolescents in divorced or remarried families would report less parental support and monitoring, and that school attachment would be more strongly associated with GPA for these adolescents. School attachment was important for teens in all families; but the effect was stronger for teens in step- or single-divorced families. Our findings have implications for parents, schools, parenting education, and youth programs. Rodgers, K. B., & Rose, H. A. (2001). Personal, family, and school factors related to adolescent academic performance: A comparison by family structure. Marriage & family review, 33(4), 47-61.